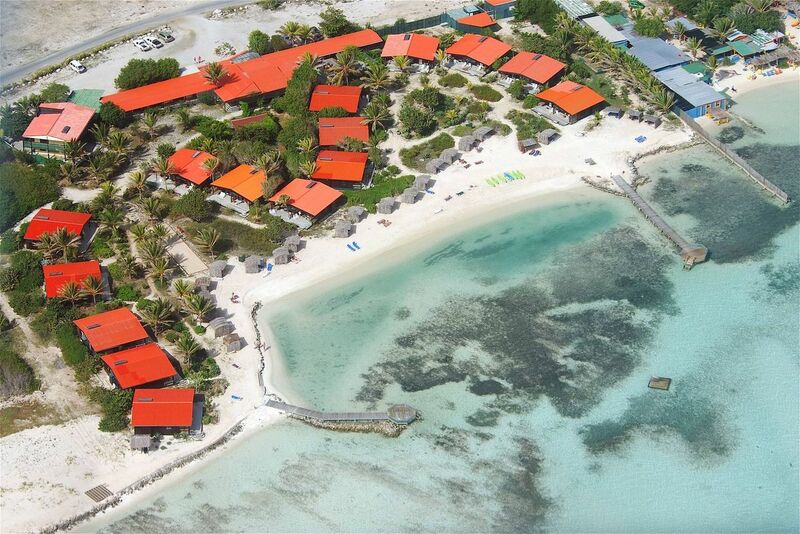 Caribbean Wind & Sun Vacations is proud to add the newest windsurf and beach resort on Bonaire to their exclusive inventory. With new management, a new business plan and newly refurbished rooms, Sorobon Beach Resort will be your favorite dream getaway for your future windsurf vacation. Nestled in sleepy Lac Bay this property has been offering one of the world’s best naturist escapes for a discerning clientele. Sorobon Beach offers 30 chalets, most with sea views. Two units have been upgraded offering high end romantic accommodations. Every chalet has AC, queen beds, ceiling fans, in room safes, kitchenettes and comfortable furnishings. Maid service and fresh towels six days a week. Beach towels and linens are provided. On site is a restaurant and bar, reading lounge and boutique. On the beach enjoy stand up paddleboarding, windsurfing or kayaking. The nearby reef is teeming with undersea life making Sorobon Beach Resort snorkel heaven. For the dive enthusiasts, East Coast Divers takes the advanced diver to the wild side enjoying the Blue Hole. For those who wish to dive the other 80+ sites, Caribbean Wind & Sun offers dive packages. What makes the property special is the wind. Our bay is one of the most popular training grounds for freestyle windsurfers from around the globe. The wide expanse is perfect for flat water cruising and when the comes up, there is excellent bump and jump action. Bring your own gear or rent from the high end line at Jibe City including JP and Gaastra. We offer discounted packages for windsurfers as well as our island renowned Concierge Services. Prices start at 65.00 USD a night and up. Call now for your free quote: 800-219-0118 or 011 599 786 3134. Email ann@bonairecaribbean.com the Windsurf Specialist. Book before April 1 for your Dec. 15-31 2010 holiday and earn special introductory packages. This entry was posted on March 22, 2010 at 4:10 pm and is filed under Activities, Diving and Snorkeling, Windsurfing. You can follow any responses to this entry through the RSS 2.0 feed. You can leave a response, or trackback from your own site. be my first booking..big discount..
NICE MOVE, Floris & Co! aw Davide, we have plenty of room for all..don’t ya love jibing around the nudists? The property will be experiencing many changes. A new owner has the privilege of making his place his own. If you or any other naturist really wanted to maintain the property as it were you could have made a bid to buy? I wish the new owners great success. I have naturists who will still enjoy the property. It’s not ruined Thor but alas, change is happening. Thanks for taking the time to explain this, I feel strongly about it and love learning more on this topic. If possible, as you gain expertise, would you mind updating your blog with more information? It is extremely helpful for me.